Petitti Garden Center is quite literally around the corner from me, making it an ideal location for gardening inspiration. 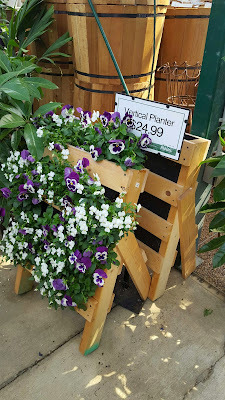 Which is exactly what I was looking for on my last visit. My daughter has recently taken to growing herbs from seed, so when I saw this vertical planter, I thought it would be the perfect solution for growing/displaying her herbs this summer. 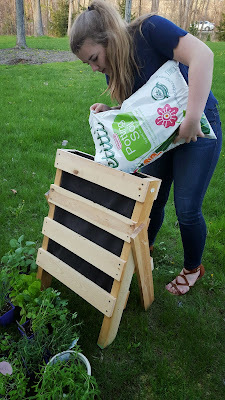 So we gathered our supplies...a vertical planter, potting soil and a variety of herbs to add to those she already had started. Once the planter was filled with potting soil, we just had to cut a slit in the landscaping cloth that lined the planter and plant our herbs. 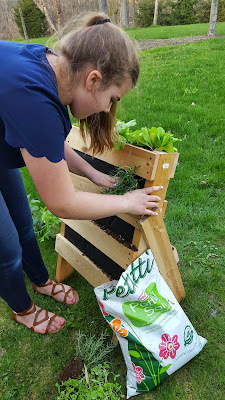 I love the rustic simplicity of our herb planter and we can't wait to enjoy fresh herbs throughout the summer. 1. 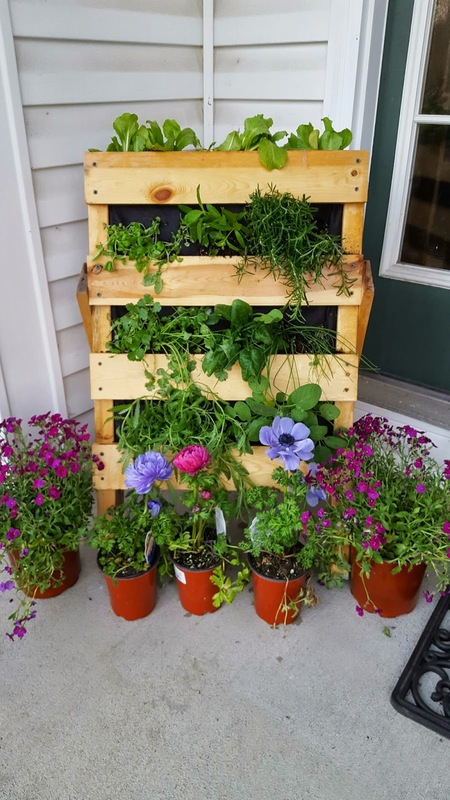 Post a comment about your summer gardening project. A random winner will be selected after the contest closes at 5 pm. on Friday, May 15. DISCLOSURE: I was given a Petitti Garden Center gift card in exchange for this post/giveaway. 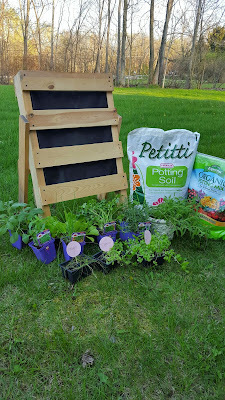 I am a regular Petitti's shopper and all opinions are 100% my own. 2014 was my year of being a Badass. 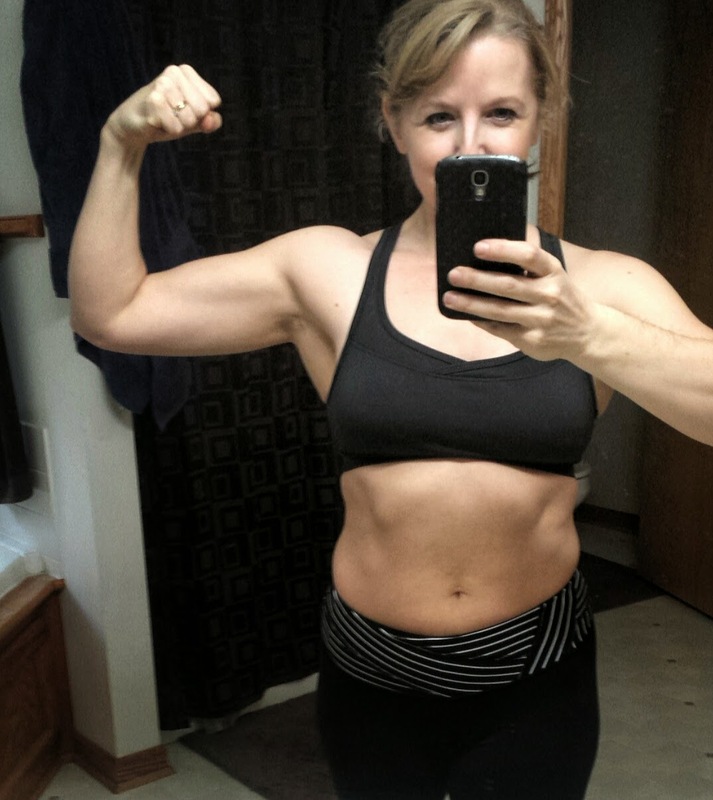 It was a personal goal that I am proud to say that I met, more often than not, especially at my gym, Living Lean. I've made great strides in my physical health over the last several years, most significantly in the last 6 months. I am stronger. Leaner. And more confident in my body. Perhaps it's the extra workout sessions...or the fact that I am now a group fitness trainer at Living Lean, but I can definitely see the difference. I feel Strong. Strong #LikeAGirl. And that's what I want to continue striving for in 2015. To build strength...both in mind and body. I invite you to join me in 2015...whether you can attend my classes at Living Lean on Tuesday and Thursday evenings (at 7:45 p.m.) or if you are making strides through your own fitness endeavors. 2015 will be a year of building strength. 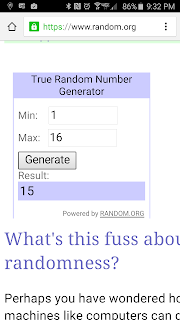 Updated: The lucky winner of the $50 Heinen's gift card is Jen V. Congrats! The NFL playoffs are in full swing...and football fans everywhere are busy planning their game day festivities. Heinen's is sharing its favorite Game Day Recipes and asked that I share a few of mine. 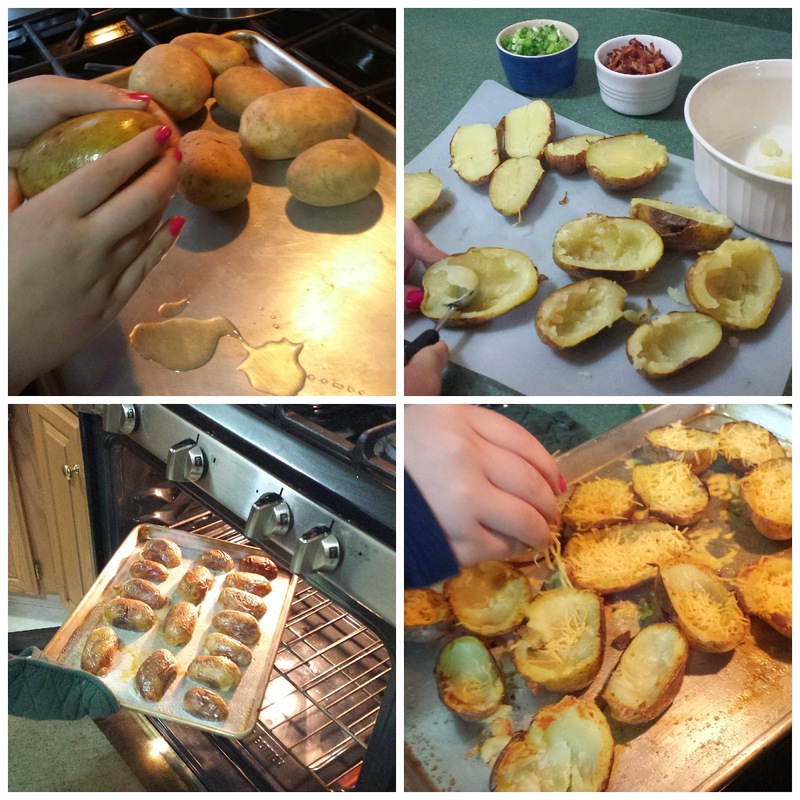 When I posed the question to my children, they both suggested recipes I have made from The Pioneer Woman's first cookbook...potato skins and BBQ Jalapeno Poppers. Both are easy to prepare and sure to be a favorite addition to your game day festivities. 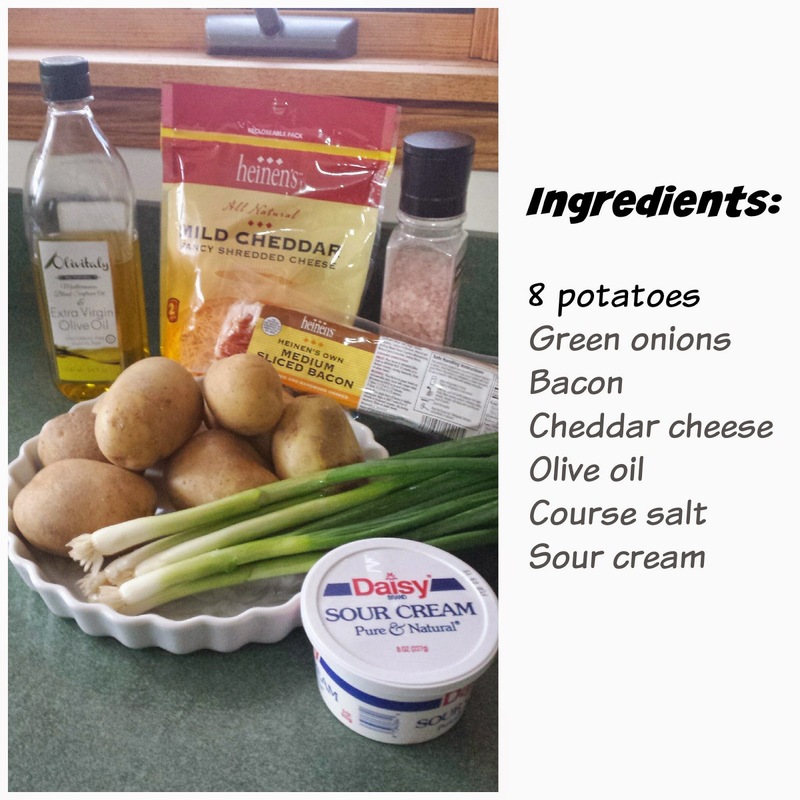 Rub olive or canola oil on 8 potatoes and bake for 45-60 minutes at 400 degrees. While the potatoes are baking, cook the bacon, cool and chop into small pieces. When the potatoes are fork tender, cut them in half and use a melon baller, cookie scoop or spoon to remove the inner portion of the potato. Brush both sides of the potatoes with oil (I used an olive oil spray because it was easier), sprinkle with course ground salt and place on your baking sheet, skin side up. Return to the oven and bake 7 minutes on each side. Then top with shredded cheddar cheese and melt in the oven for 1-2 minutes. Then comes the fun part...topping them. 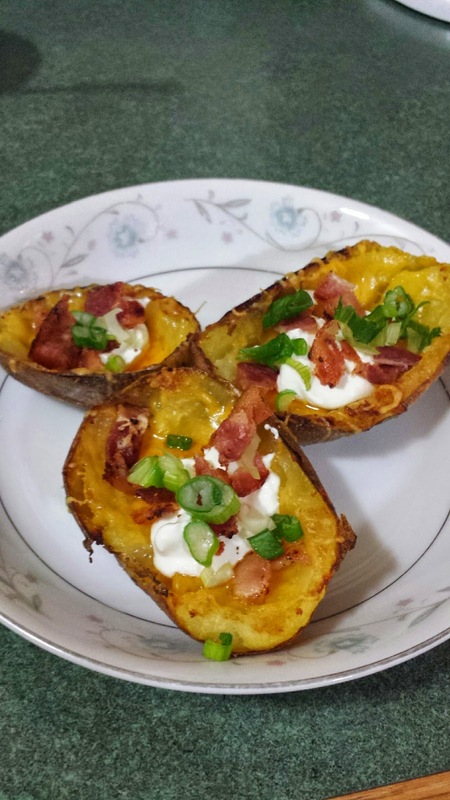 I garnished them with a dollop of sour cream, diced bacon and chopped green onions. YUM! 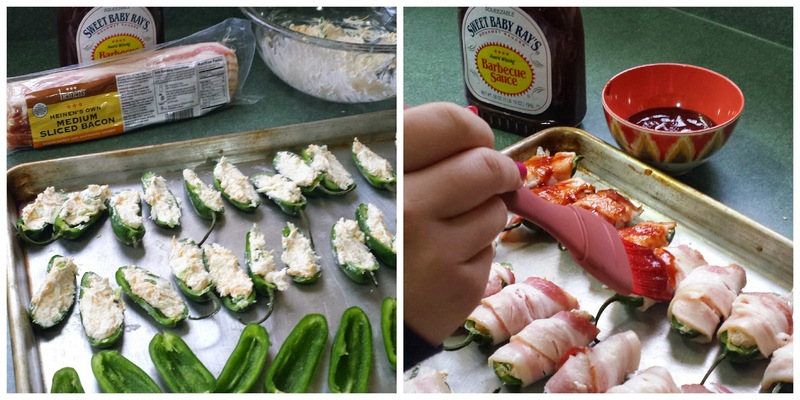 The BBQ Jalapeno Poppers are a little more time intensive, but one of my all time favorite appetizers. Preheat oven to 275 degrees. Then get to work on the jalapenos...I wore rubber gloves to cut the jalapenos in half and scrape out the seeds with a spoon. Next, fill the jalapenos with a mixture of cream cheese, green onions and cheddar cheese. 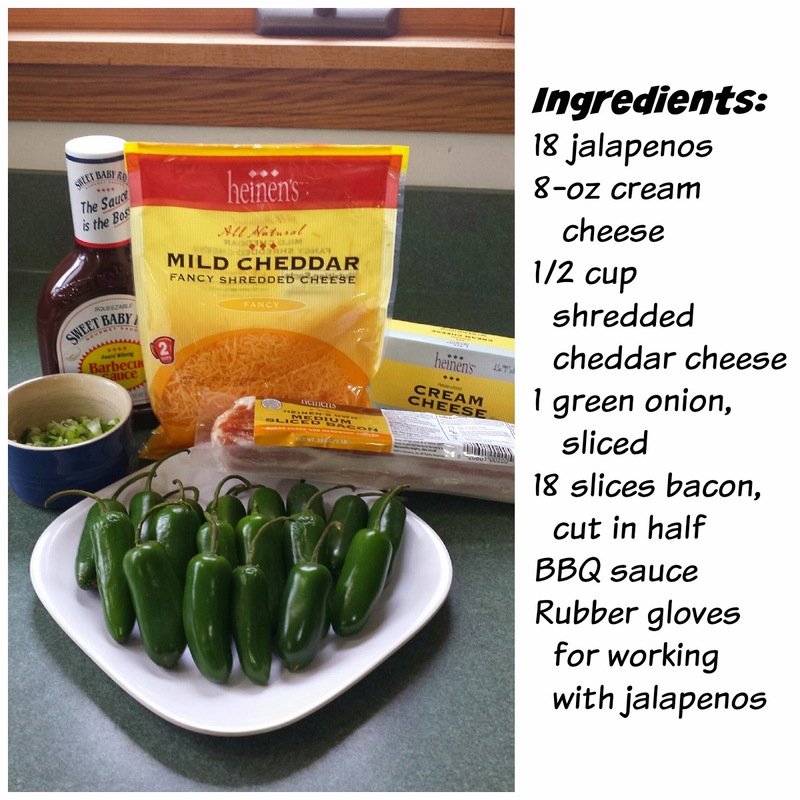 Wrap each jalapeno with a half slice of bacon and then brush with your favorite BBQ sauce. The original recipe suggests securing the bacon with a toothpick, but I omitted this step...and they still turned out well. 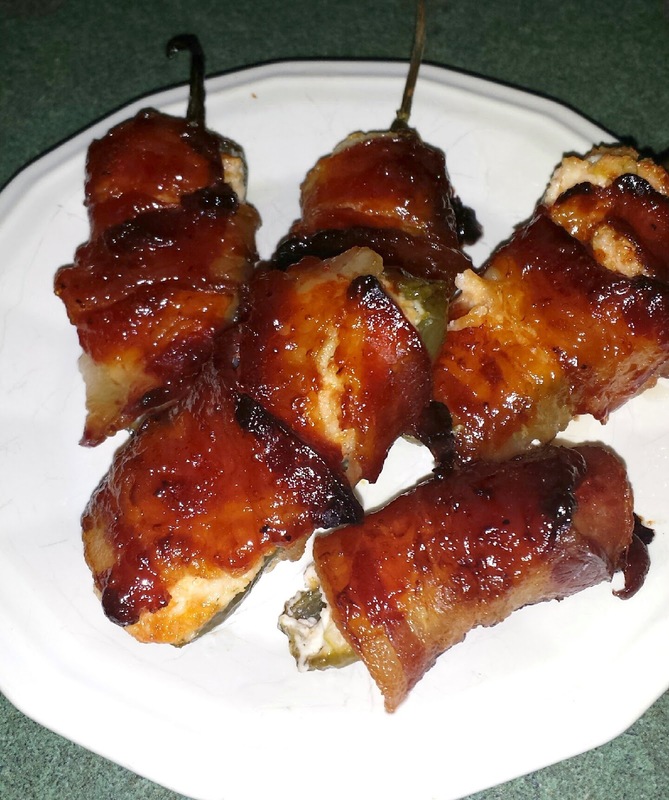 Pop the jalapenos in the oven for 1 hour, or until the bacon is sizzling. Serve hot or at room temperature. And be prepared...these will go quickly on game day...you just might want to double or triple the batch if you're hosting a big party. To help you with your own game day preparations, I have a $50 Heinen's gift card to giveaway to one lucky reader. To enter...just leave a comment with your favorite game day appetizer. Bonus entry: tweet about the giveaway (remember to tag @Managed_Chaos and use #Heinens), then leave a comment letting me know you tweeted. 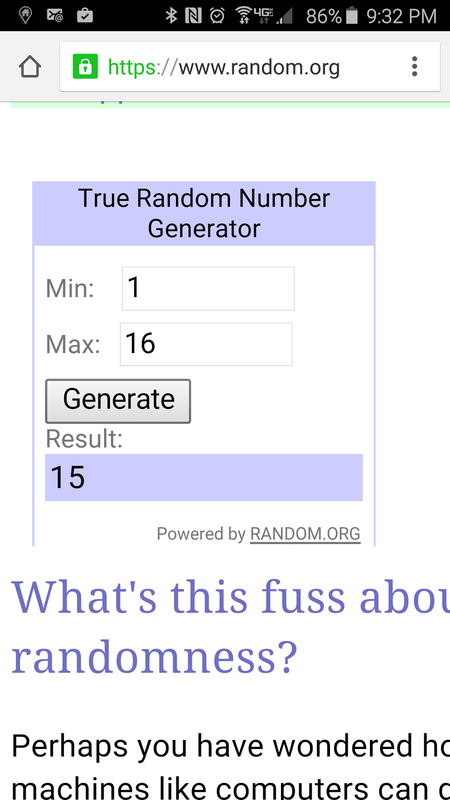 One comment and one tweet per person (two total possible entries). Winner will be randomly selected from comments on this post after 6 p.m. on Friday, January 16. Good luck! Disclaimer: This post is part of Heinen’s Game Day Recipe campaign. I was given a gift card in exchange for a post about my favorite game day appetizer. I'm a regular Heinen's shopper and my thoughts are 100% my own.